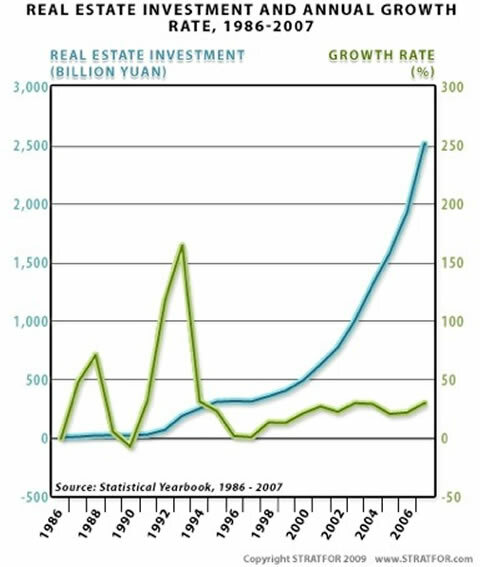 Today I offer you an insightful look at China's real estate market - a "burgeoning bubble" that deserves a close eye as the possibility for breaking increases. Remember the chaos in Japan after their own housing dreamscape got violently yanked back to earth? As investors, we have to recognize opportunities - and know what to avoid. With a global economic crisis - and now surging housing prices in China - investors in any global market need to keep watch on political and economic developments around the world. Today's analysis comes courtesy my friends at STRATFOR, a global intelligence company. They provide unique and on-the-money analysis and forecasts on all things global, essential for any alternative investment strategy. They've got a free newsletter as well, for which I encourage you to sign up by clicking here - so you're not limited to my caprice. The real estate market in China, particularly the residential side, is a burgeoning bubble that is growing bigger and more breakable by the day. 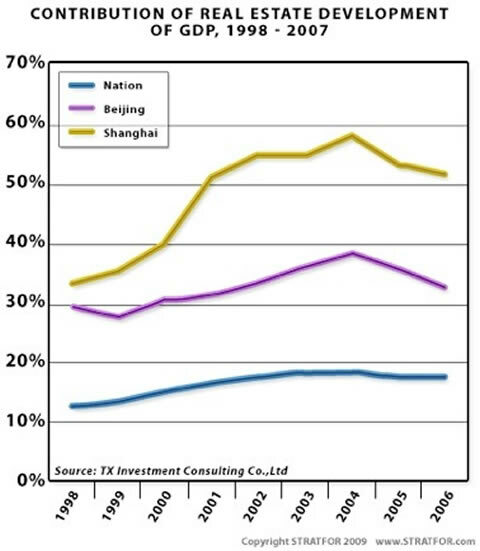 Land and housing prices were already rising steadily when Beijing's stimulus package hit the sector in early 2009. Now prices are surging, with developers, bureaucrats and investors cashing in while urban Chinese - once encouraged to invest in home ownership by the central government - become less and less able to buy. Editor's Note: This analysis is part of a series that explores China's industry, finance and statistics. On Sept. 10, China Overseas Land and Investment, a Hong Kong-listed company and a subsidiary of state-owned China State Construction Engineering Corp., purchased a prime piece of real estate in the Putuo district in downtown Shanghai. The company paid 7.006 billion yuan ($1.026 billion) for the undeveloped property, which will amount to an average of 22,409.3 yuan ($3,283.9) per square meter of floor space (just in land costs) once the designed residential building is constructed. The purchase created China's newest "land king," a term for the real estate developer who pays the highest price for a piece of real estate during a land auction. And 7.006 billion yuan was the highest price ever paid for a piece of Chinese real estate for any purpose - residential or commercial. The milestone is a result of an increasingly intense competition for land in major cities that began early in the year, when Beijing began distributing stimulus money to various industries - including the real estate sector - to sustain the economy. As a result, land prices have soared throughout China. And with increasing speculative investment in residential real estate, the market faces a surging bubble that jeopardizes the country's long-term economic development. Since 1998, real estate investment in China has accounted for more than 10 percent of the country's gross domestic product (GDP), compared to only 3 percent to 5 percent in the United States. Such investment is also closely associated with many other industries, such as construction and finance, and it provides an abundance of jobs. Therefore, it is seen as a critical pillar of China's economy and enjoys favorable policies from the government and state-owned banks (more than 70 percent of real estate investment in China comes from bank loans). At the same time, real estate developers, local government officials and investors have escalated housing prices across the country by acquiring massive land holdings, limiting the supply and inflating prices, creating a real estate bubble that is not sustainable in the long run. The bubble has grown mainly on the residential side of the market, where there is more demand and higher profits to be made. However, while fewer developers and investors have been chasing nonresidential projects, Beijing's 4 trillion yuan ($586 billion) stimulus package in early 2009 has generated more interest and activity in the commercial side. Indeed, there are signs that commercial real estate may also be headed for a bubble, and STRATFOR will be watching the situation closely. Since 1978, China's pace of urbanization has increased dramatically, with the number of middle-size and large cities (those having nonagricultural populations of more than 200,000) growing rapidly. Beginning in 1985, economic reforms implemented in urban areas to make China's planned economy more market-oriented added even more momentum to the real estate boom, with real estate investment increasing by 71 percent by 1987. The government's macroeconomic policy of monetary belt-tightening helped cool this overheated market, which was further tempered by the government's continuing to provide housing for state employees (fu li fen fang, or "welfare housing"). However, when the state significantly cut back on its welfare housing program in 1998, the Chinese perception of personal property changed, and this would have an important impact on the real estate sector. The government began this privatization process by making a private dwelling a "commodity" and granting the purchaser the right to own a newly built house for 70 years. (Likewise, the developer who buys the property on which residential or commercial buildings are to be constructed may own that property for 70 years.) Home ownership in China could now be a sound financial investment. Thus, the residential real estate market would boom in almost every urban area in China - and particularly in the "first-tier" and "second-tier" cities (only Beijing, Shenzhen, Guangzhou and Shanghai are in the first tier, with more than 20 cities, and mostly provincial capitals or coastal ports are in the second tier). But rising land prices would eventually put housing prices out of reach for the general public. In Dongguan, a coastal second-tier city in Guangdong province, land prices averaged 4,957 yuan ($726.42) per square meter in 2007, a more than 500 percent increase from 2003, while personal disposable income increased 24 percent during the same period (from 20,526 yuan [$3,008] to 27,025 yuan [$3,960] per year). A 2006 survey conducted by the National Development and Reform Commission showed that the average ratio between housing prices and income was approaching 12:1 in many large and middle-size cities in China (in Beijing it had reached 27:1). Twelve to one is significantly higher than the World Bank's suggested affordability ratio of 5:1 and the United Nations' 3:1. The problem was compounded by the fact that, of the more than 80 percent of Chinese who owned their own homes in urban areas (generally considered cities with populations of more than 20,000), 54.1 percent were making monthly mortgage payments that constituted 20 percent to 50 percent of their monthly incomes. Following a temporary drop toward the end of 2007, land prices rose steadily, then began surging again with Beijing's stimulus package and a flood of easy credit in 2009. With much of this money flowing into the real estate sector, major beneficiaries included large state-owned enterprises (SOEs) involved in speculative real estate and housing investment, contributing to the inflating bubble. Among the 10 highest-priced land purchases in major cities in the first half of 2009, 60 percent went to SOEs. Paradoxically, as the global financial crisis continues, China sees little choice but to loosen its monetary policy even further, fearing the opposite would curtail economic growth and result in massive unemployment, which could lead to social instability. Beijing knows that one of the country's underlying economic problems continues to be an overheated real estate market, but it also knows that the real long-term solution - limiting the flow of cash and credit - could have dire socio-economic ramifications. Meanwhile, real estate developers, government officials and investors continue to speculate on real estate, raising land and housing prices. As housing prices continue to rise, a parallel trend is manifesting itself - rising vacancy rates in urban areas. A 2009 report by the Shanghai Yiju Real Estate Research Institute revealed that, by the end of 2008, the average vacancy rate for "commodity housing" (as opposed to welfare housing) in Beijing was 16.64 percent, and vacancies reached as high as 30 percent in some districts. Most of these vacant houses, however, are not unsold ones. They have been purchased by investors as speculative investments. While there are fewer and fewer ordinary people who can afford to buy houses, there is still excessive demand for investment housing - pressure that continues to drive up the prices. This closed loop in the Chinese real estate market is facilitated by the country's political and bureaucratic system. In China, all land is initially owned by the state, and local governments have the sole authority to sell it. And income from property taxes and land sales are a primary source of revenue for local jurisdictions. According to estimates by the State Council's Development and Research Center, tax revenue from the land in some jurisdictions accounts for 40 percent of the local budget. Moreover, net income from land sales accounts for more than 60 percent of the local governments' extra-budgetary revenue. The soft budget and lack of accountability to the people reinforces the local governments' incentive to expand their real estate investments without much concern for cost or impact on public services. Economic performance also is the prime prerequisite for bureaucratic advancement, which gives local officials the incentive to generate as much revenue as possible through land auctions. And this generally involves a level of collusion - and corruption - among government officials, real estate developers and investors. One typical strategy is for a developer to buy a big chunk of urban land from the local government but leave the land undeveloped, or build on only a small portion of it, thereby keeping the housing supply limited. Despite various state policies to lower land prices in order to make homes more affordable, local government officials and real estate developers control the land auctions. When a lower sale price is dictated from above, it is easy enough for the local sponsors to officially deem the auction a failure. Even when the developer does build houses on the property, a speculative investor, working hand in hand with the developer and government officials, can bribe both parties to ensure that he can buy all the houses at a low volume price and keep them off the market, thereby maintaining a limited supply and high prices. Another factor that enters the equation is a cultural one. The Chinese people generally prefer to buy new houses, as opposed to renting homes or buying secondary houses in which people have already lived. Indeed, in urban areas, marriage proposals often include a promise to buy a new commodity house. As a result, the secondary housing market remains very small in comparison (due also to fewer available bank loans for lived-in houses and the complicated process involved in transferring ownership). All of these factors contribute to the burgeoning real estate bubble - and make it difficult to predict when that bubble will burst. With 70 percent of real estate investment in China coming from bank loans, a dramatic drop in land values could send shock waves throughout the economy. There are already signs of decline. In Shenzhen, one of China's first-tier cities, real estate prices have been dropping for the past two years (30 percent for housing), and many developers and speculators have suffered great losses. The threat looms in other large cities such as Beijing and Shanghai and may be emerging in many second-tier cities as well. Given the current global economy and the economic balancing act it must maintain domestically, Beijing has few good choices. It must keep enough cash flowing to maintain economic growth and social stability in the short term while tightening credit to avoid a tsunami of bad loans and a market collapse over the long term. Certainly, Beijing does not want to face the kind of collapse in the housing market that Japan experienced in the 1990s, which triggered a financial crisis and more than a decade of economic malaise. nice article such a nice info.